where non-integral right-shifts were not being evaluated properly. There were several reports, both internally and externally, of GWT-based applications unexpectedly crashing when running in Safari 5 (including Google Wave). Upon further inspection of the crash, we determined that the bug is triggered when calling several of GWT's array sorting methods, which in turn perform non-integral right-shifts as part of the compiled code. That's the bad news. The good news is that we have a fix for this issue, plus several other house keeping items that we've rolled into a 2.0.4 release, which can be downloaded from GWT’s main download site. If you’re experiencing the Safari crash, you’ll need to recompile and deploy your GWT app. The changes in 2.0.4 are completely compatible with your existing 2.0 app, and should have no negative impact. To that extent we’ve already dogfooded 2.0.4, verifying that it fixes the Wave crash that was originally reported. Recently Apple released Safari 5, which included a bug where non-integral right-shifts were not being evaluated properly. There were several reports, both internally and externally, of GWT-based applications unexpectedly crashing when running in Safari 5 (including Google Wave). Upon further inspection of the crash, we determined that the bug is triggered when calling several of GWT's array sorting methods, which in turn perform non-integral right-shifts as part of the compiled code. (GWT), a major overhaul to the gwt-gadgets project has been underway and we are excited to announce that these changes are ready to be released as gwt-gadgets-1.2.0. Adds OS Lite API (1.0) core support. Updates the Gadget RPC sample and provided a utility class to simplify use of GWT-RPC. Adds support for gadget Locale settings. HTML strict or quirks mode can be selected. Gadget manifest names can be generated with short or long format. Changes the Feature classes to interfaces to allow mocking for unit testing. Adds a new sample application with demonstrates the use of Open Social, OAuth, App Engine and the Maps API together in a gadget. We would like to recognize Hilbrand Bouwkamp for helping update the GWT-RPC support in the library. Hilbrand is the author of cobogwave which adds Google Wave specific support for GWT based gadgets. Although its only been a few weeks since the previous release of the open source gadgets library for Google Web Toolkit (GWT), a major overhaul to the gwt-gadgets project has been underway and we are excited to announce that these changes are ready to be released as gwt-gadgets-1.2.0. Today's guest blog post comes from Matthias Büchner, Software Engineer at digital security company, Gemalto along with his colleagues: Colin Gormley, Jonas Pärt and Ella Segura. Here they discuss their Device Administration Service, and the recent port to GWT. Use the same code base for both the hosted and offline solutions. A single code base would reduce the cost of maintenance and support in the future without increasing too much the upfront cost of development. In order to achieve this we needed a solution that was not dependent upon any server based technology. Improve testability. One of the biggest problems for the existing DAS solution was the lack of sufficient automated unit and functional tests. A large amount of time and resources was required to manually validate the solution. Enhance usability. The existing DAS was still using the submit/refresh page approach of web 1.0 and definitely needed modernizing. The re-design was a good opportunity to select a technology that offers a more desktop-like experience. Identify which features require a serve-side component. These were going to be our problem areas. Look for a solution that will run inside a browser offline. We wanted to keep the interface the same for both hosted and standalone deployment. Select our technology carefully, keeping in mind testability and cross-browser compatibility. A smart card is a secured electronic chip typically embedded in a plastic card or inside a USB dongle. Two examples of what a smart card can do are managing physical and logical access, and securing electronic transactions. Despite their small size, they offer a self-contained operating system and can run very advanced applications. The card is connected to the PC using a smart card reader and the low level communication between the reader and the smart card is done via an APDU. We investigated the GwtEvent class and its callback mechanism to manage the asynchronous communications. An event is fired just once, and it is handled by one or more handlers. The one-to-many model fits perfectly with how we wanted to manage the notification mechanism when the card is either inserted or removed from the reader. We created card insertion and removal events and utilized an event bus to manage the event firing. Unfortunately, we found difficult to follow and debug event-driven code. Callback mechanisms are better suited for one-to-one relationships between the callers and the callees. We opted to use callbacks to manage most of the business and low level logic, since they are mostly one-to-one relationships. When several callbacks, that required data sharing, were chained in sequence things got a little ugly. We started with nested callbacks. As you can see in the AsyncCallbackExample class, the code flow can be difficult to follow and decipher. To solve the problem, we created the following Wrapper class. This class allows us to create a final instance of the data we need to share. Separate callbacks no longer had to be nested to access and change the data we are passing around. This class allowed us to improve the readability and ease the maintenance of our code. You can see in details how to use it in our class example. Our goal was to move all our source code to Java/GWT; this includes the entire user interface that was designed originally with ASP controls. We looked for an existing widget library since we did not want to spend a lot of time developing custom components. ExtJs GWT was a library that some of us were already familiar with, so it was a natural choice. From a bird's eye view, most of the interface looks the same. Take a closer look, and you'll find that much of the details have been improved. We knew we wanted to structure our code in a way that would allow us to decouple the interface from the business logic. The video from Google I/O 2009 on best practices for architecting GWT app pointed us in the right direction. We adopted the MVP pattern and divided our UI code into presenters and displays using the gwt-presenter library. In the DAS application, there is more than one presenter at work on any single screen. We needed the presenters to interact with each other but did not want them too tightly coupled. To address this issue, we brought in the event bus. Instead of presenters listening to events being fired by other presenters, now everyone alerts the event bus when something significant happens and registers themselves to the event bus for any events they are interested in. The DAS application is currently localized for three languages. Implementing the Constants and Messages interfaces was very straightforward. We put all the text in an Excel spreadsheet for delivery to our translators and converted it into Property files. One aspect of the DAS user interface which is different from traditional web applications is that we have to interact with a smart card. Almost every function of the application requires a smart card to be inserted and some features require two smart cards. The smart card itself is a difficult device to test, it needs to be inserted into a smart card reader and much of the website is driven by smart card removal and insertions. Automating the device would require some sort of smart card or reader emulator that would trick the system into believing that the device was inserted. The technology involved is very low level, and emulating the interface is not a trivial task. We had to look for another solution. Here is an overview of our application architecture. 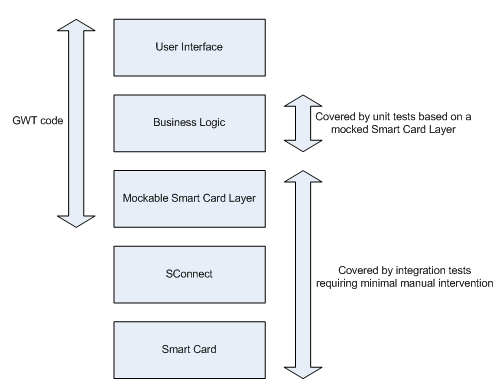 We abstracted the Smart Card Layer to mock device interactions to higher layers and kept some of the manual (or semi-manual) tests for the lower layers. It divided out tests into two categories; unit tests and integration tests. 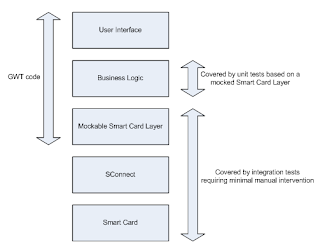 Unit tests would use mocked Smart Card layer while the integration tests would require real smart cards to be inserted into readers during test execution. To enhance the testability of our code, we wanted to be able to mock parts of it that requires a smart card. To be mock-able, the Smart Card Layer needed a contract with the upper layer, we put in place an abstract base class that would expose functional methods and at the same time lock down how the result and potential errors were to be reported. Any class inheriting from the base class would be responsible for the device interaction. This contract would allow us to write an implementation for every type and variation of smart cards we needed to support, with the added bonus of allowing us to add a mock smart card layer implementation. The mock smart card implementation doesn't actually perform any smart card operations. Instead, we configure in the setup code of a unit test the expected input and return values for the test case. Here is an extract of the mocked class extending the abstract class shown above. A unit test sets up the underlying mock classes for the test scenario and then makes the call to the subject of the test. These tests allowed us to validate our business logic in different use cases independent of a smart card. In effect we were able to make sure that our application would fail gracefully if the smart card behaved in an unexpected manner. We used the code coverage tool EMMA to assert that every anticipated (and unanticipated) failure condition worked properly. Using the above techniques, we exceeded our expectations of automated test coverage. Overall, we are impressed and excited about what is possible with GWT. We were able to rebuild a complex browser-based application and deliver a consistent product for both the offline and hosted solutions with improved user experience and testing methodology. The new DAS is one of the first smart card applications built with GWT at Gemalto. This project has proved to be a great learning experience for the team. We hope the foundation we built here will be a spring board for many more GWT applications to come. Thank you for reading our article - for more information about DAS, please visit http://www.gemalto.com. Update: Patrick Chanezon, Google Developer Advocate, has supplied us with a video interview with Matthias, which can be found here. This release is now available for download at the Google API Libraries for GWT project, hosted on Google Code.